The origins of the band lie in 1990 when Candice was working at a local New York rock music radio station, and as part of her work first encountered Ritchie (now ex-Deep Purple/Rainbow guitarist), then with Deep Purple, at a soccer game he was playing in. The two became romantically entwined and discovered that they shared a passionate interest in the Renaissance. 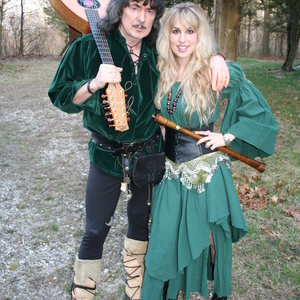 After leaving Deep Purple in 1993 and recording an album as Ritchie Blackmore's Rainbow called Stranger in Us All in 1995, on which Candice contributed backing vocals, Ritchie became interested in the idea of bringing Renaissance music to a contemporary audience. The effervescent personality of Candice and her singing talent made her the natural choice as "frontman". In 1997 the pair were ready to launch the band, the name being a pun of their own names, and which would consist of themselves plus session musicians. Debut album Shadow Of The Moon was an instant success, most notably in Europe. In subsequent albums, particularly Fires at midnight, there was an increased incorporation of rock guitar into the music, whilst maintaining a folk rock direction. Over time, Candice has increasingly participated instrumentally as well as singing the vocals, and is competent in a wide variety of Renaissance instruments. The group performs at Renaissance Fairs and Renaissance Festivals, as well as in stand-alone concert tours in appropriate venues including 'castle tours' of Europe, where they perform in historic surroundings for an audience dressed largely in period costume. The band has been successful enough to inspire a tribute band called Renaissance Night. Their 2006 album, Village Lanterne, contains of more rock songs than earlier albums, including covers of Street of Dreams (Rainbow), Child in Time (Deep Purple), St Theresa (Joan Osborne) and Streets of London (Ralph McTell). On June 27, 2008, the band's latest album, Secret Voyage, was released.